I was playing on Google last week and decided to type in Pat Hastings to see what came up. The first thing that came up was a TV show that I was a guest on called Daring to Dream with Suzie Spivey. I hadn’t seen the interview in many years. What a joy it was to watch it again and see what was happening in my life back then. I was amazed how confident I was and how the words just flowed out of me. It’s hard to believe that I retired from the VA hospital as an Alcohol and Drug therapist in Rhode Island and published my book, Simply a Woman of Faith ten years ago. After I retired, at the age of 62, I became a Certified Spiritual Life Coach and started a new business as a radio talk show host, an inspirational speaker, a workshop and retreat leader and loved what I was doing. I followed my heart and moved to Maui seven years ago in January and expected to continue on the same path and doing what I loved. Spirit had other PLANS for me. Isn’t that often the way. You think you are doing one thing and in mid- stream the PLAN changes. I can hear Spirit saying, “Recalculate, recalculate.” We make plans and God laughs. I had only been living on Maui for a couple of weeks when I heard Spirit say, “I don’t want you to DO anything, I want you to learn how to BE.” I thought I knew how to BE. I was wrong. I knew how to DO very well, but BEING was something I needed to learn. BEING is about allowing, surrendering and accepting what is. It is the feminine way. I had been a DOER all my life and was out of balance and didn’t know it. I was used to hearing the small, still voice of God, so I paid attention. I gave it all up; the coaching, speaking and giving retreats. My friend and I facilitated one or two workshops, but that was it. When I landed on Maui, I lived with friends on the ocean and paid $300 a month for rent so I didn’t have to make money to live. I’m not sure what it is about 7 years, but it took me 7 years to write my book. My book almost died inside of me because I didn’t believe in myself and was filled with fear. Can you relate? It truly was the grace of God that I was able to move through the fear and publish my book. I am so grateful that I didn’t give up because I wouldn’t be living the life I am living and married to my soulmate. At the age of 72 and living on Maui for 7 years, the PLAN has changed again. I am trusting that I have learned how to BE and I am now more balanced. I am following my heart and have said YES to Spirit. I am currently enrolled in the Sacred Mystery School to become a Certified Sacred Sexual Educator. I am on fire and passionate about facilitating and teaching this profound, yet gentle Awakening and Healing AH process to clear trauma from the body. It is pure, sacred and holy and I feel honored to be on my soul’s path. Although excited and passionate, I am SCARED and all my insecurities are coming to the surface. I am giving a talk this week and will be interviewed on the Gutsy Women Radio show. I am stepping out in faith and trusting as I don’t feel like I have the right words to explain this powerful, profound healing process yet. I am “showing up” and asking Spirit to speak through me and give me the right words. I am remembering how I have always been given what I need. I am letting go of outcomes and trusting that the women who will benefit from this sacred healing will find me just as I miraculously found Caroline and Amrita. I know God’s PLAN is good. I stand in my POWER and say YES. I will continue to love my life, face my fears, have fun and BE the best me I can be. I am in the mystery and don’t know what’s in store in this new adventure. All I know is that in this moment, EVERYTHING IS GOOD and in perfect and divine order. As we sat sipping our tea and sharing our lives with one another, My friend looked at me and said, “Pat you are riding the wave.” That really resonated deep within me. I have never surfed, but have watched the surfers here on Maui and it looks exhilarating and fun. Being on top of the wave and flying through the water and air appears to be both scary and adventurous. I know beginner surfers have been injured when the wave hits and they go under. It looks so easy, but it takes many years of commitment and practice. This made me reflect on my own life and deciding to become a Certified Sacred Sexual Educator. I feel like I am riding the wave and it is fun, adventurous and exhilarating. For me, riding the wave is being aligned with Spirit and allowing things to flow to me with peace, ease and grace. Although it is not effortless, it almost feels like it because ideas and people “show up” to show me the next step for my journey. For example, although people have known me for the last 10 years as “Simply a Woman of Faith” and I will always be Simply a Woman of Faith, I wanted to reinvent myself and get business cards and a website for my new business. I prayed and asked Spirit to lead me to someone who could help me with a new website. The next day I was sharing with my daughter, Mary, about wanting to create a new website. She said, “Mom, I can do it for you, it’s easy.” The next thing I knew while we were still on the phone, she was creating a new website through Word- press, which I am familiar with and we will work on it together. We went to GoDaddy and found a name for my new business. It will be “Sacredawakeningandhealing.com” I am so excited and will let you know when it is done. If I want to continue to ride the wave and not crash and get tossed around and get injured, I need to FOCUS. To be honest, this is not my strongest point. Whenever I leave the house, Larry’s parting words are “Pat, remember to FOCUS.” We laugh because he knows me well and how I dance through life sometimes and don’t take the time to think about things before I jump in head first. Not only do I need to FOCUS, but I need to pay attention to how I’m taking care of myself in body, mind and spirit. I must be balanced in all areas of my life: eating healthy, exercise, resting, time alone and time with Larry and friends and family. My number one priority is my relationship with self and Spirit. I take the time each day to go within to pray and meditate. I ask for help and guidance with EVERYTHING. I listen and follow through when I hear the small, still voice of God. I TRUST that I am always being guided and if I am doing something that is not for my highest good, I will be redirected. It is just like when the GPS on your phone says recalculate when you are going in the wrong direction. I have my personal GPS guiding me. Many years ago, I made a commitment to do God’s will and follow wherever I was being led. I am living in the mystery and don’t know what’s ahead and that is a good thing I take one day at a time and choose to live in the present moment because that is really all there is. I could not have imagined 10 years ago when I retired from the VA that I would be living on Maui, married to my soulmate and now starting a new career at age 72. Oh happy day. I want to continue practicing riding the wave and trusting God with this adventure called my LIFE. I would like to share a powerful email I received from my friend, Kerri, in response to my blog about meeting the woman on the plane last week. She shares about what happened when she listened to her intuition, trusted and didn’t worry about the money. “I always enjoy your blogs, but this week’s blog really touched my heart. I could hear my mom’s words to me, “God speaks through his people,” as you described the encounter with the woman on the plane. How could that be anything other than a “Divine Appointment?” You were her angel, and I know she got off that plane feeling different than when she boarded. I still hadn’t had a chance to meet with the LA team about my Maui-based business and discussing the legalities around using the Harmonyum trademarks. My teacher still hadn’t lectured yet, and 2 of the 4 training days were over. announced when due to his busy schedule. I brought products to sell and as of early Saturday, I had only sold 4 items. My rack was still full of ponchos, scarves, and t-shirts. the training, because she’s brilliant. As I sat in the lounge at the yoga studio, my intuition was telling me to change my flight back to Maui and go home on Monday. I decided to receive a Harmonyum session to listen and ask for guidance about what to do. After the session, my friend said, “I will be giving a lecture, but not until noon on Sunday.” That made it clear and I called the airline to change my flight back. Along with $125 for changing the flight, I found out that I didn’t have enough miles to make the change, but the lady on the phone said, “I can gift 1,000 miles once a day, and I will gift it to you.” There was 1 seat left back to Maui on Monday morning. I then found out that I didn’t owe any extra money for renting the car an extra day because what I had paid covered an entire week. Sweet!! As I sit on the plane waiting for it to take off, my heart is full of gratitude and awe. I am returning to Maui from Oakland, California after assisting Amrita Grace at the Awakening and Healing Sacred Sexuality weekend. The only way I can describe what I am feeling is that I am on FIRE to share this sacred, holy work with all women. This work is powerful and profound as well as gentle and safe. I have EXPANDED and gone deeper than I ever thought possible. I am healing trauma and deep wounding in my body from this life time and past generations. What a great opportunity to assist Amrita and learn how to lead a weekend workshop. Learning to teach this work is one of the best decisions I have made. When I complete my training, I will be able to teach this practice all over the world. How good it that and in divine timing. Being on the “other side” as an assistant, I watched the women on the weekend transform before my very eyes. The women faced their fears and embraced the Goddess and power within. It was extraordinary and beautiful to be a part of. As part of my six- month training to become a Certified Spiritual Sexual Educator, I will be leading a workshop along with 2 of my classmates on Maui on January 5-6. The weekend is starting to fill up and we are so excited. On the plane ride to Oakland for the workshop, I experienced a DIVINE set-up or what I call a GodIncidence. I sat next to a young woman that when we started talking, we didn’t stop for 4 hours. I was led to share with her that I was an Alcohol and Drug therapist for 20 years. That opened another door that was extremely meaningful. She shared her family dynamics as her mother is an active alcoholic. She also shared how she always attracts men who have addiction problems and didn’t understand why. I know more than ever that I am always guided and provided for when I listen and follow my heart. I “show up” and trust there is a divine plan and God’s timing is always perfect. This workshop is a great way to get introduced to sacred sexual awakening and healing (AH) in a safe, clear impeccable step-by-step process. The AH practice is a self-healing modality for clearing trauma, shame and blocks to pleasure and enjoyment. We hold trauma, emotional and energetic imprints in our bodies that can be released with this unique, transformational healing. I am on FIRE and in awe! It’s unbelievable how in one week’s time we can go from the bottom of the pit to the mountain top. Thank you God! A couple of weeks ago, I asked for prayers that my condo would sell from my Face book friends. Many people responded and said they would pray. I received an offer from a woman within a few days. In the meantime, I received a text from my friend, Cathy, who worked at the VA with me before moving to Maui. She saw it on face book and responded. I called Cathy “my angel” because she spent many hours helping me with computer stuff when I was writing Simply A Woman of Faith. I could not have done it without her assistance. Cathy wrote, “I have a friend, George, who is looking for a place to buy, is yours still available?” We had just signed the agreement the day before so I had to tell her that I had another offer. A week later, the women backed out and the condo was back on the market again. I remembered Cathy’s friend, George, and contacted her immediately. She said, “George is still interested.” I gave her my real estate agent’s number for him to call. George and I started texting and I asked him “What are you looking for?” He said, “Someplace close to the VA, small and ready to move in.” It sounded perfect for him as it was only a few blocks away from the VA and it was ready to move in to. My real estate agent, Bethany, later informed me that George and his girlfriend were expecting a baby and she was 7 months pregnant and ready to nest. That brought tears to my eyes because I knew that they were the perfect family to buy my condo that is filled with love and peace. I continue to learn through this experience of closed doors and waiting on God. I had to be patient, have faith, let go and trust that God’s timing is perfect. It is clear that the closed doors had nothing to do with me and what I’m doing or not doing. In other words, I wasn’t doing anything wrong. I had to wait for George to SHOW UP. I believe that everything is planned in the mind of God and I am always being guided. If I hadn’t asked for prayers on Face book, Cathy wouldn’t have known I was selling the condo. Thank God we cannot see the whole picture and what Spirit is doing in the background. It is always for our highest good and guaranteed that the right door will open at the right divine time. I shared a few weeks ago that the sale of my condo in Rhode Island fell through 4 days before settlement. Of course, I was disappointed and shocked, but I accepted “what is” and put the condo back on the market. In last week’s blog I shared I had another offer on the condo. It was not what I had expected (several thousand dollars less), but I was grateful I had an offer. We signed the agreement and the inspection was set for this week. I felt peaceful and envisioned everything moving with peace, ease and grace. I received a call from my real estate agent the morning of the inspection and I could tell in her voice that she didn’t have good news. She said, “Pat, I’m sorry to tell you this but the woman backed out of sale and cancelled the inspection. We will have to start all over and put the house back on the market.” I was in SHOCK and felt very weary. I got off the phone and cried in Larry’s arms because I felt so disappointed and devastated. I couldn’t believe what was happening because it was the third offer that fell through and the condo has been empty since July. It felt like I was hit by a truck and I spent the day going within and loving myself; two- hour nap, journaling my feelings, praying, crying, forgiving, remembering, hot bath, breathing and letting go of expectations and what I wanted. I needed to allow myself to BE and feel my feelings and not do a spiritual bypass, even though it felt awful. I know my feelings are messages from my soul and I needed to pay attention. Fear quickly came to the surface as I “future tripped” on what could happen if I didn’t sell my condo. I wondered if I was doing something wrong?” Has that ever happened to you when something doesn’t turn out the way you envisioned or wanted? I asked Spirit for a message because I didn’t understand what was going on. Here is what I received. When I woke up the next morning, I felt hopeful, peaceful, renewed and like something had shifted deep inside of me. Spirit guided me to read a book that I bought forty- three years ago when I was going through a difficult time and needed God’s guidance. It’s called “How God Guides us” by Don Basham. * Closed doors are a vital part of guidance. Don’t be afraid of closed doors. * When God closes a door, it’s because His/Her plan involves something else. If a door is closed, another door will open. * The door of His/Her choice will open further down the line. I wrote a book called Simply a Woman of Faith and have been on the faith journey for many years. My faith muscles are growing stronger and stronger every day. I only want to be aligned with God’s will and I trust I am being guided through open and closed doors. We are all invited to make a commitment to TRUST Spirit, God, Love and the Universe even more deeply and to remember everything is already planned in the mind of God and we are always being guided to our highest and best good. Do you listen to the small, still voice of God within or do you ignore the messages that you receive every day? I wouldn’t be living on Maui if I hadn’t listened, followed my heart and trusted I was being led. When we are paying attention, messages come in many ways; through our dreams, books, other people, prayer, synchronicities, journaling, meditation or just an intuitive knowing what to do next in your life. I met Melina in July at the Sacred Feminine Mystery School we were both attending. I loved her energy and we spent time getting to know one another. She shared how much she loved “Mother Maui” as she had been there many times before. She was thrilled when I invited her to stay with us in our home. She accepted the offer and has been with us all week. Because of her experience, I have given BIRTH to this new DIVINE IDEA. 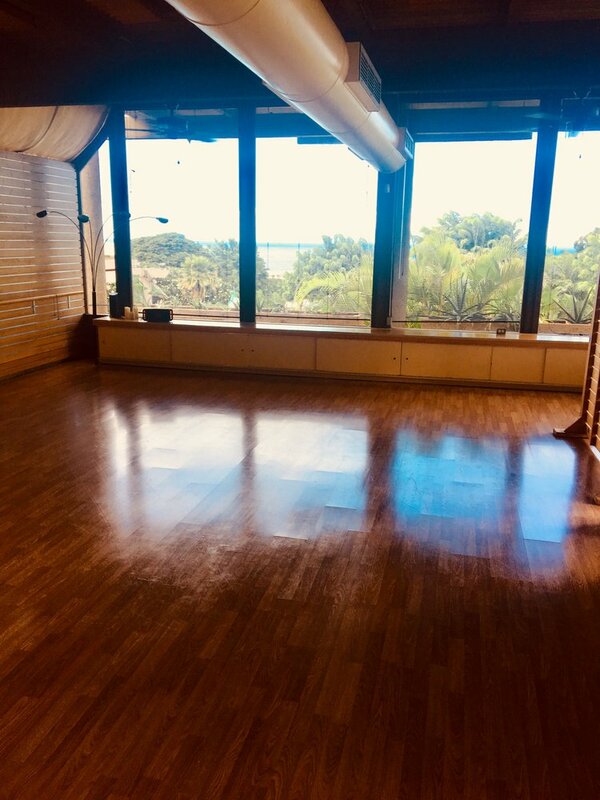 Larry and I are opening our hearts and home and will be offering our “GUEST SUITE” for a personal retreat to nurture your soul and spirit while you are on Maui. If you desire, we will share helpful hints about special places to visit for renewal, and time to simply unwind and flow into your own internal rhythm. We will provide you with helpful details to help ease your retreat planning, such as affordable places to rent a car, and where to pick up your food on your 1/2-hour drive from the airport to our home. We prefer to host only female guests who are traveling solo, and on a weekly basis. This respite is a sacred time for you to share with yourself. Our deepest desire is that our home will offer you peace and love and what you seek in renewal, and more. Let each day of your stay be one guided by your heart as it directs you to the many pleasures that Maui has to offer”. If your heart is pounding and you feel excited about the prospect of a personal woman’s retreat on Maui, please email me or call 401-862-8859. We would love to talk and discuss all of the possibilities with you! “I am so honored to be the first woman to accept the loving invitation of a personal retreat on Maui. Pat and Larry have a beautiful and spacious, love filled, home. My one-week stay has been truly splendid and nurturing. I was greeted so lovingly by both of them, shown around the house, and sunk shortly thereafter into a comfortable bed where I slipped into a welcoming sleep after many hours of travel. It was dark when I arrived, so it wasn’t until morning that I was able to see that just down the hill from where their home is situated, the ocean makes her presence known by a long expanse of blue in three directions. There is a sweet melody of birdsong that soothes, the fragrance of Plumeria that bloom in the garden, and the house is peaceful and filled with fresh, pure air and sunlight. My week has been filled with sacred time with Maui Mama! With daily dips in the ocean, and sunshine streaming through my mind, my eyes have filled with light as they have a deep affinity with the healing blue of ocean and sky. Every day has been a wonderful honopono adventure where I have been guided by Spirit. I have cherished every minute of it! Before my arrival, Pat shared all I should know to plan my trip. She was present at the beginning and end of my day to hear of my adventures, or not, as I was invited to do whatever I wanted. I leave this evening on a red eye flight, not wanting my retreat to ever end, yet full from the love of this home and Maui, ready to bring my reconnection of heart and soul home with me. I cannot express my gratitude to my kind hosts, Pat and Larry, for sharing their guest suite with me. The opportunity to come home to myself on this lovely isle is truly graced with the spirit of Aloha! With my deepest gratitude, I will be back!